The countdown to the 2015 RHS Chelsea Flower Show is upon us. This is an event I am very fond of and can probably say that I look forward to it more than any other garden show. We are now at the stage where the drawings and descriptions of the show gardens are being released. We know who is designing what for whom and getting an idea of what they will look like. Though I have to say that some of the plans seem more successful than others in showing a flavour of what might be. This is the first of two posts as otherwise it will all be a bit long. I have not done this is a priority order, it is just how the whim took me and I did deliberately spread the ones I am most keen to see over both posts. Some gardens get a bit more publicity than others. Designing for the show sponsors, this year M & G Investors, will always get you quite a bit of coverage and rightly so, they are not going to let someone design their garden who they think might scrape through with a bronze. Jo Thompson is designing their garden this year and it will involve an oak retreat inspired by Vita Sackville-West’s writing room. The blurb tells us that the planting aims to be romantic and to follow the principles of traditional British gardening, so that sounds worth a look. 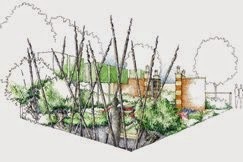 Laurent Perrier are sponsoring the Laurent-Perrier Chatworth Garden, this is a garden I will be looking forward to seeing. Firstly it is being designed by Dan Pearson and I admit to being a bit of a fan or his work both in design and his written work. It is also based on part of the Chatsworth gardens. I have visited Chatsworth House many times from when I was a child and I last visited about two years ago as it remains a place I enjoy. So this will be an interesting garden for me. Having a Prince involved always gets you a headline or two, the Sentebale Garden is being created by the Sentebale Charity that Prince Harry founded. If having a prince involved gets attention to the cause then this is no bad thing. 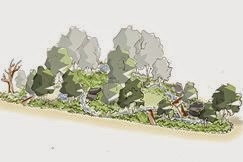 It is being designed by Matt Keightley who’s garden last year won the People’s Choice Award and it was a very fine garden. I would even go so far as to say I was surprised that he did not get a gold medal last year. I would be very surprised if this garden did not do well. Andrew Wilson and Gavin McWilliam’s garden which is being sponsored by Darwin Property Investments for Wellington College and is called the Living Legacy Garden. This garden is to mark the Battle of Waterloo which celebrates its 200th anniversary this year. It is one battle I remember of the date of due to an old joke as apparently it was fought at quarter past six in the evening. This is however not a battle I know very much about so in terms of not forgetting history it is not a bad thing. A brief scan on Wikipedia told me that upwards of 40,000 soldiers were killed across winners and losers and it lead to exile of Napoleon to St Helena and its famous green wallpaper. It is really hard to see from the drawing what it will look like, but the tall spikey things look interesting. Alan Gardner is designing the Viking Ocean Cruises Garden, and funnily enough it is designed to be a bit like a ship. Alan is also going to be hosting a Channel Four series called ‘The Autistic Gardener’ to be shown in March 2015. This sounds a very interesting series involving a team of autistic gardeners to work on neglected gardens. So a bit of a one to watch out for I predict. 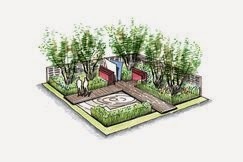 Marcus Barnett is designing the Telegraph Garden. Now this caught my eye as the blurb says it is inspired by the De Stijl Movement. I confess I did not immediately recognise what this movement was. So a bit of a google later and I realise that I recognise what is being talked about even though I did not know its name. Finding out what a garden is about does add an extra level of enjoyment. I am sure you can enjoy it perfectly well thinking that De Stijl is a sort of yoga exercise, but knowing that little bit more will mean you either say ‘yes, I can see the connection’ or ‘no, I’m still thinking yoga’. 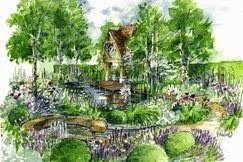 I have included photographs from the RHS Website, though I am not sure they give me much of an idea of what I will be seeing. 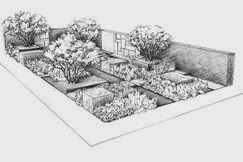 Drawings are no substitute for seeing the real thing and in terms of getting an idea of the scale and reality of the planting and some of these drawings, quite frankly, tell me very little. Still, I console myself with thinking that if they gave everything away it would spoil the fun on the day. 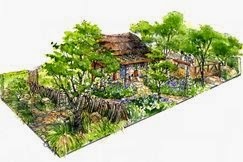 They all look full of promise, I wish Diarmuid Gavin would design a Chelsea garden again, if just for a little bit of unconventional wacky fun! Well there's some interesting designs there.... And like you, I can't wait to go this year after missing out in 2014. i love and adore Chelsea.... The build up, the sheer buzz, the inspiration,.... Ooh such excitement!